HARRIS INDUSTRIAL GASES fills pure and mixed gases on site, and we respond to urgent requests much quicker than larger, corporate facilities with stringent schedules. If you need your own cylinder returned after a fill, you can rest assured your tank never leaves our facility and will not get lost among thousands of other cylinders. HARRIS INDUSTRIAL GASES can take care of ALL your Industrial Gas and welding supply needs. We fill thousands of cylinders on a weekly basis. Our state-of-the-art equipment and fully trained service personnel meet all guidelines of the Cylinder Gas Association and GAWDA (Gases and Welding Distributors Association). HARRIS is a proud member of the Industrial Gas Suppliers Alliance and the American Welding Society. Our many satisfied users include Utility Companies, Co-Generation Plants, Alternative Fuel Manufacturers, Light and Heavy Industrial Manufacturers, Auto Malls (dealers and repair shops), Florists, Supermarkets, Wineries, Blacksmiths and Farriers, Ornamental Iron Fabricators, Fencing & Railing producers, Restaurants, Hydroponic Gardeners, Fish Hatcheries, Pet Stores, and Recyclers. 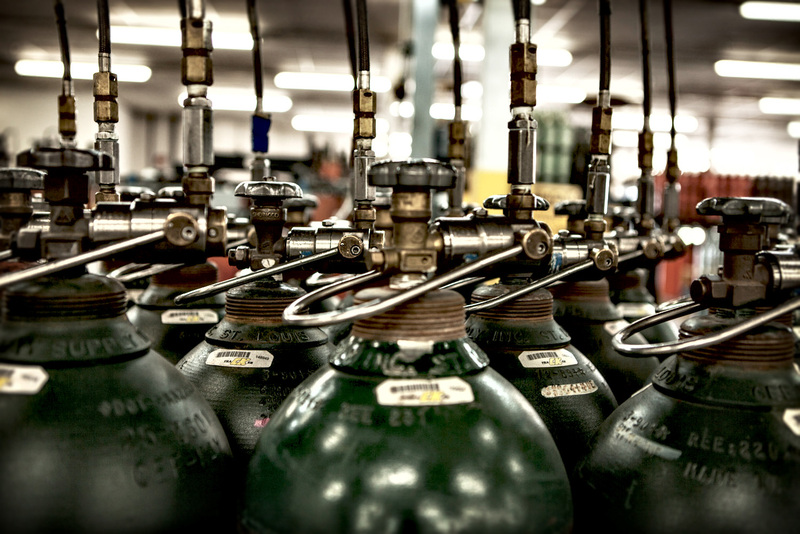 We regularly stock an extensive selection of industrial gases, including Oxygen, Acetylene, Propylene, Propane, Carbon Dioxide (including dip tubes), Argon, Nitrogen, Helium, all Shielding Gases and Mixes, OSHA-Grade D Breathing Air, Aviators’ Breathing Oxygen, Beverage Gas Mix, Hydrogen, and Methane. Whether you have one cylinder or a truck full, we can “fill” your needs. In addition to an extensive selection of industrial gases, HARRIS has the latest equipment and supplies to assist you with your day-to-day operations. We offer top- of-the-line brands of tanks, regulators, gauges, hoses, fittings and valves. Make HARRIS INDUSTRIAL GASES your one-stop shop for all your industrial gases and supplies.